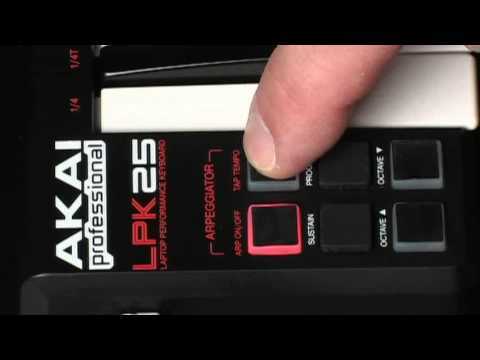 The Akai LPK25 laptop keyboard is a scaled-down relative to the MPK series of keyboard performance controllers. The diminutive keyboard is made up of 25 miniature, velocity-sensitive keyboard keys with synth action. Create melodic and harmonic riffs in seconds, anywhere, with the Akai LPK25 laptop performance keyboard. Posted on 27/10/2012 by Rory I got this for Christmas and I was over the moon. There are, though, two bad points. Sometimes it takes a while to process what you are playing and that can be confusing if you are recording. Secondly the keys are too close together so you end up playing the wrong notes. On the other hand it is only £39.99, so a really good buy and worth getting one for your home studio. It is a really simple piece of equipment so you don't get confused with which buttons to press. If you are on a low budget and need one of these it's under 40 quid, so get it. Posted on 11/10/2012 by Tom I bought this MIDI Keyboard 3 months ago and for what I bought it for - it has been perfect! I have very limited space in my bedroom studio and this controller has done everything I want it to do. It's very, very easy to set up (literally just plug & play) and has instantly given me much more control over my samples. Being able to control sounds with a piece of hardware brings production to another level and gives much more inspiration. Whilst this is the very entry-level controller it will do perfectly for those with limited space and a low budget! If you have the space, then a controller with more keys may be a better option but for just under £40.00 (now reduced to £29.99!) this is a steal! Due to the small size this is also ideal for the 'on the move' producer and could easily fit in your laptop bag. It has memory banks along with an arpeggiator, sustain button, octave up and down, and tap tempo controls. These can all create new ideas giving you a different perspective on the sample you're using. All in all this piece of equipment is ESSENTIAL to your studio. If you're thinking about it - Get One!